Cashae Monya as blues singer Billie Holiday at ion theatre. Billie Holiday had a right to sing the blues — though she considered herself a jazz singer. At least that’s what she tells us in “Lady Day at Emerson’s Bar & Grill,” Lanie Robertson’s 1986 biographical concert/play that’s set in a seedy South Philly club in 1959. This was her final performance; Billie died three months later. Her early (and later) life was something of a disaster, as she relates in 85 intermissionless minutes, telling stories between songs and drinks and a wobble offstage for a hit of heroin. She calls her addictive vices “moonlight” (as she exhorts her enabling accompanist, “I need a little moonlight”). “What a Little Moonlight Can Do,” indeed. The offspring of a teen mother, whom she called The Duchess, Billie was often left in the care of others. She was raped at age 8, in juvenile court at age 9 and a school dropout by age 11. Starting at age 14, she and her mother worked at brothels in Philadelphia and then in Harlem. That’s where she heard the music of Louis Armstrong and Bessie Smith. And that’s when she started singing. Later, one of her many bad choices in men got her hooked on smack. And it was up and downhill from there. She’s on parole now, she tells us, after said boyfriend set her up on a drug charge, for which she got a year in the clink. All along, she’s been misused by men and given bad advice from them, too. She got her start during the Jim Crow era, traveling the East coast and often having to enter clubs by the back door; she wasn’t even allowed to use the restroom, let alone eat out front. She has no love for white folks (“ofays” or “grays,” as she calls them), though she describes close camaraderie with the guys she toured with in Artie Shaw’s band. Now her license has been taken away and she can’t sing in New York any more. The songs she chooses this evening punctuate or illustrate her stories. In “Ain’t Nobody’s Business,” she sings, “I’d rather my man would hit me/Than for him to jump up and quit me”). “Pig Foot (and a Bottle of Beer)” recalls Bessie, as well as Billie’s own down-and-out background, while underscoring her alcoholic needs (she often changed the “bottle of beer” to “a bottle of gin”). She resents always having to perform her signature songs — “God Bless the Child,” a tribute which she ironically wrote for her mother right after The Duchess turned her away, because she didn’t like Billie’s latest guy (rightly so). And then, there’s “Strange Fruit,” the gut-wrenching evocation of lynching and the hateful racism she witnessed in the South. (Often attributed to Billie, the song was actually written by Abel Meeropol under the pseudonym Lewis Allan, but Billie made it famous). Over the course of her 85-minute set, we watch her get progressively shaky, forgetful, disoriented. She mistakes her accompanist (skillful, effective Brandon Sherman) for her old boyfriend. She slurs her words, trails off mid-sentence, loses her train of thought. We’re observing the dissolution and self-destruction of an icon. At ion theatre, under the direction of Claudio Raygoza, the sense of a nightclub is excellently established with low lights, cabaret-style table seating and wine for sale. On a raised platform, under a spotlight with a standing mic, Billie spirals down before our eyes. 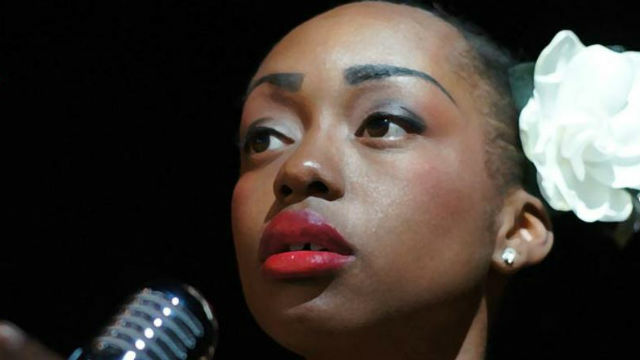 Petite, talented Cashae Monya is not trying to imitate or impersonate Billie, though with her wide-eyed, big-smile charisma, she captures the diva’s thin, reedy voice, eccentric vocal styling and unique phrasing. For Billie, it was all in the ache, the feeling, the delivery. Monya does a fine job with the emotional arc of the piece, which is somewhat flawed in its structure and speedy trip down memory lane. Monya is a magnetic and compelling performer. With every show, she’s stretching herself, either dramatically or musically, or both. This is yet another feather in her expanding theatrical cap. Performances are Thursday-Saturday at 8 p.m., Saturday at 5 p.m.